Asan saves U.S. patient with successful liver transplantation. February. 26, 2019 07:49. by Gun-Hee Cho becom@donga.com. A birthday song filled the air at the liver transplantation unit Friday in East Wing of the Asan Medical Center. Charles Carson, a 47-year-old American man shed tears of joy in his patient gown at the sight of his birthday cake. 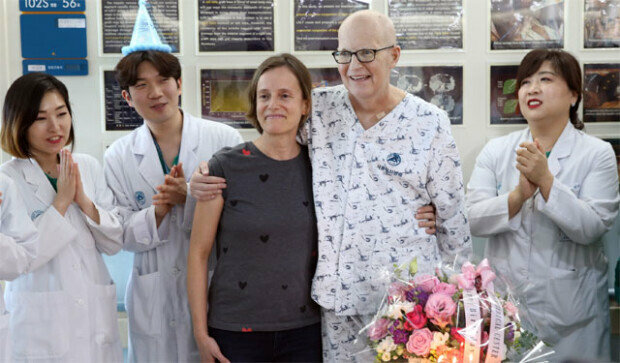 Having been rejected from some of the best medical centers in the U.S., Carson visited South Korea last November for a liver transplant operation, and back then, he wasn’t sure if he were ever to celebrate his 47th birthday. It was in 2011 when Mr. Carson’s struggle for life began. He visited Stanford Medical Center for examination and was diagnosed with myelodysplastic syndrome and hepatocirrhosis. He needed a healthy liver to survive the painful process of cancer treatment, but there was no telling when a suitable donor might appear. The only hope left for him was to get part of his wife’s liver transplanted. But even the best doctors in the U.S. turned him away for it was a “tricky operation.” Their concern was rooted in the possibility of a relapse triggered by his marrow disorder. Last autumn, doctors at Stanford referred Carson to the Asan Medical Center in Seoul, with the note that the medical techniques for live-liver transplants were much more advanced in South Korea. In August last year, Asan became the first medical center in the world to have reached the mark of 5,000 liver transplant operations. Asan’s one-year survival rate stands at 97 percent, much higher than the average of American hospitals at 89 percent. A sliver of hope in mind, Carson visited South Korea to live. Professor Song Ki-won at Asan's Department of Liver Transplantation and Hepatobiliary Surgery felt that the operation would not be easy, but he could not fail his patient. On December 19, Carson underwent laparotomy where his liver and peritonea were attached to each other, his blood vessels clogged with clots. The operation, which typically takes about 10 hours, went on for a grueling 18 hours. The scale of surgery was massive, requiring the volume of blood for two adults. There were some difficult times, but Carson recovered in two months and went back to his country on Monday. He thanked the medical staff of AMC for helping him to get back his family and his ordinary, yet happy life. “It is very encouraging that Stanford Medical Center, one of the top-10 hospitals in the U.S., has sent their patient to South Korea,” said Lee Seung-gyu, a chair-professor at Asan’s Department of Liver Transplantation and Hepatobiliary Surgery.